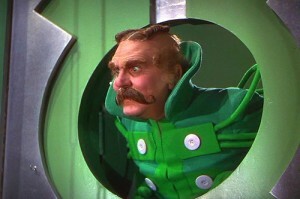 To hear Josh Olson tell it, he’s courting all kinds of trouble by writing a script for a proposed follow-up to MGM’s classic film, “The Wizard of Oz.” According to the Los Angeles Times interview with Olson, who wrote the 2005 film “A History of Violence” — don’t tell me he’s not versatile — he expects some pushback from purist fans of the original. Actually, what he said was the following: “You want to write something that takes people back to the fondness they had for the original. I’m aware of the fact that there are a couple million people who will come to your house and burn it down if you don’t get it right” — which would, after all, be one more chapter in the history of violence. 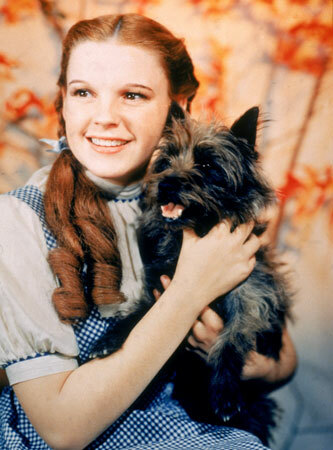 However, the script Olson submitted to Warner Brothers is not intended as a re-make of the Judy Garland film, which is why I used the term “follow-up” earlier. The proposed new film, to be called simply “Oz,” would deal with a granddaughter of Dorothy Gale who visits the Other Side. This really would be in keeping with the history of the story introduced in 1900 in the form of a children’s book (“The Wonderful Wizard of Oz”) by L. Frank Baum. The book and a play adapted from it a couple of years later were very successful, and Baum — apparently nobody’s fool — wrote a total of 14 Oz books. Those books, plus 19 written by Ruth Plumly Thompson, two written by Frank Kramer, one written by Rachel Cosgrove, and a final one written in 1963 by Eloise Jarvis McGraw and Lauren Lynn McGraw, are considered the “canon” of Oz literature. Obviously, in the aggregate they wander far from the premises of the original story. 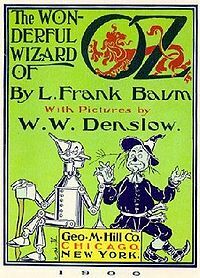 The title page from the original "Oz" book. Literary critics with a lot of time on their hands have tried over the years to read political messages and other serious subtexts into Baum’s work, but Baum himself insisted that he had intended only to write stories for the entertainment of children. Oz, in other words, was not like Wonderland. Olson’s premonition of an angry mob — tongue in cheek, of course — put me to mind of the furious gang that gathered outside the Binney & Smith plant in Easton, Pa., about a decade ago to protest the retirement of certain colors in the Crayola spectrum. Change can be a buster. The LA Times blog is at THIS LINK. 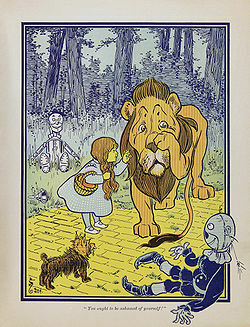 Dorothy meets the Cowardly Lion in W.W. Denslow's illustration of "The Wonderful Wizard of Oz." Very interesting. I had no idea there was an Oz “canon”. My remembrances of the story are pure Judy Garland – and in black and white, thank you very much. I did laugh at your comments about the retirement of the Crayola colors. One of my most-read entries is about the attempt to introduce new, “child friendly” colors such as “Awesome” and “Bear Hug”. Some folks were not amused. We went on one of the last tours at the Binney & Smith plant. Before we were taken into the factory itself — with its millions of crayons marching along on the conveyors — we saw a short film about the company, and it included a scene with the color-change protesters. It was interesting to see how seriously some folks take a thing like that.